whats up! my friend has an 07 750. he sent me these pictures. he thought it was leaking from the screw circled, but i know the weep hole is behind that. temps have been swinging pretty wildly. its 60f today, last week the high/low was 9 and 0.
i know from my experience with car water pumps, if its leaking out the weep hole, its time for a new one. of course he hasnt been riding the bike at all. he says this happens when the the temps change like this. he said it did it last year too, but not as bad. my question is: is it normal for this much fluid to come out of the weep hole? maybe the temp variance is a factor? or is this a clear sign he should replace the wp? i guess im just not sure if the weep hole is designed to relieve pressure or if its sole purpose is to indicate failure. when i say he should, what i mean is me, because he doesnt turn wrenches at all. he doesnt mind watching though. i just dont want him to drop 200$ on a new pump if this is normal. i ride a honda so i dont ever have these kinds of problems. i could use some advice. he lives an hour away, so i havent put eyes on it personally. 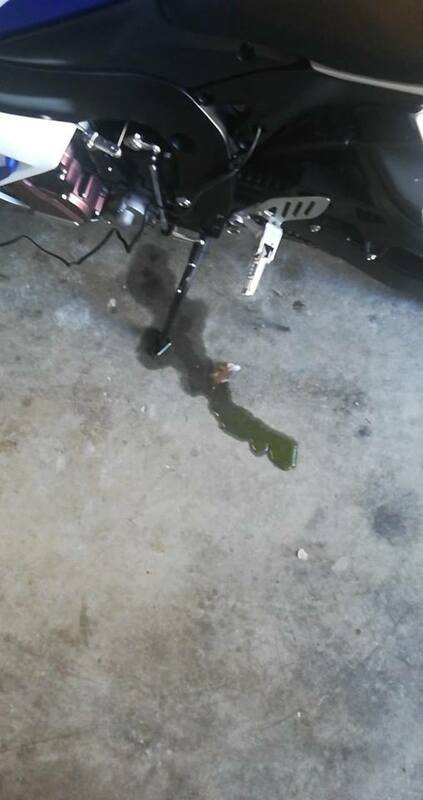 but he said he was pretty sure the fluid was coming from that area. im just gonna assume its from the weep hole. much appreciated for your help! what it kept somewhere where it could have frozen in the zero degree madness? Not normal for anything to come out of that hole. If it does you are only one seal away from it getting into the crankcase. You'd have to pull the pump to check it, but as long as the shaft has no excessive play you could just replace the seals as they are available separately. About $50 for all of them. its in his non heated garage, but its attached. im sure it gets cold in there, but id think it stays a little warmer than outside sharing 2 walls with the home. far as i know it has a 50/50 blend in the cooling system. its a street bike, so i assume thats the case. ie: he doesnt run water wetter or whatever, but he hasnt touched the system since he bought it 2 years ago. we had plans to flush it this spring before this issue reared its teeth. now, i suppose thats a certainty. Last edited by 954kevin; 02-03-2019 at 09:52 PM. those were my thoughts and exactly what i told him. one seal away from coolant in the crank and rod bearing failure. i just wasnt 100% sure if maybe it wasnt designed to do leak with pressure changes, like from weather swings. i assumed not, but thought id ask before i told it would need to be repaired. ill give him the option on the seals. i did watch a youtube video of a guy replacing the wp seals. it involved heat and some finesse. it looked like something one could botch if they werent careful. im pretty confident in most things, but ive never done anything quite like what i saw in the video. heating to extract, press fitting.. just seems like an opportunity for an inexperienced hand to f up. then ending up with more costs. where as im 100% i can bolt the new unit in without issue. ill put it to him like that and let him decide if he wants me to try my hand at it or just plop a new wp in there. i appreciate the responses fellas. yeah, it should be a quick n easy fix. we were planning to flush the coolant anyway before this showed up. I did some quick YouTube searches on it. Looks pretty easy. 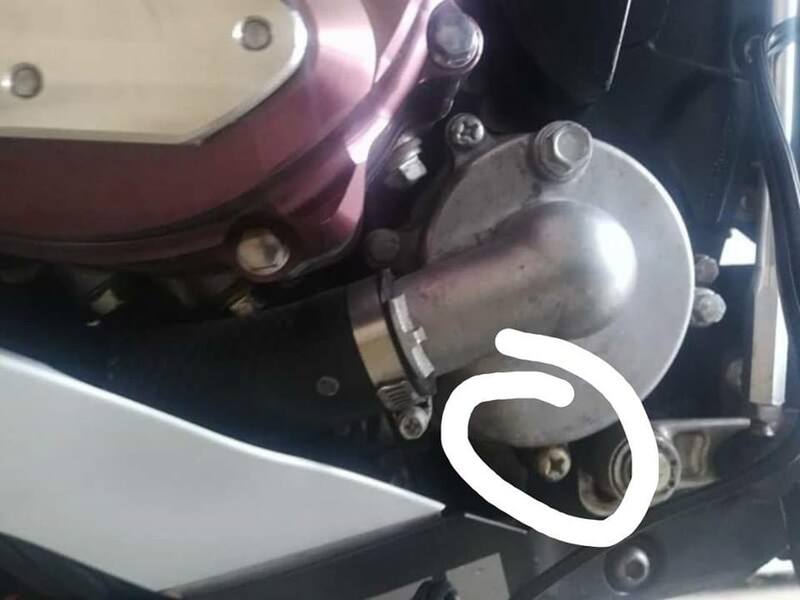 My vfr actually has a drain screw on the water pump so you don’t have to remove the hoses. Need to be sure and do a flush and fill on mine soon too. the 750 has a drain plug located on the pump as well. my 954 has one on the pump and a second one up near the head that also has to be drained to get all the fluid out. i suppose the fluid gets locked in up there via negative pressure/vacuum. Well that’s good. The guy on the video was just taking off the hose. I thought that seemed like a stupid way to design it!